It finally happened. After standing on the shore for years, you decided to take the plunge and become a kayaker. Congratulations! There’s nothing better than gliding through the water, your paddle slicing though the waves while you explore inlets, waterways, and islands. Before you begin, however, there are a few things you should get before you dive in. By being well prepared, you’ll set yourself up for a long and successful life as a kayaker. Not all kayaks are created equal, and the type you choose to purchase will depend on where you plan to do most of your kayaking, how many people you want to put in your kayak, and how confident you feel on the water. Most kayaks can hold anywhere from one to three people. Plastic kayaks are the cheapest (you can find them new or used for a few hundred bucks), while Kevlar kayaks can cost up to $4,000. If you live on the coast, you’ll want to look at sea kayaks, which have longer bodies that allow them to cover more distance. If you live in the mountains, you may want to invest in a whitewater kayak, which is made of high-impact materials. 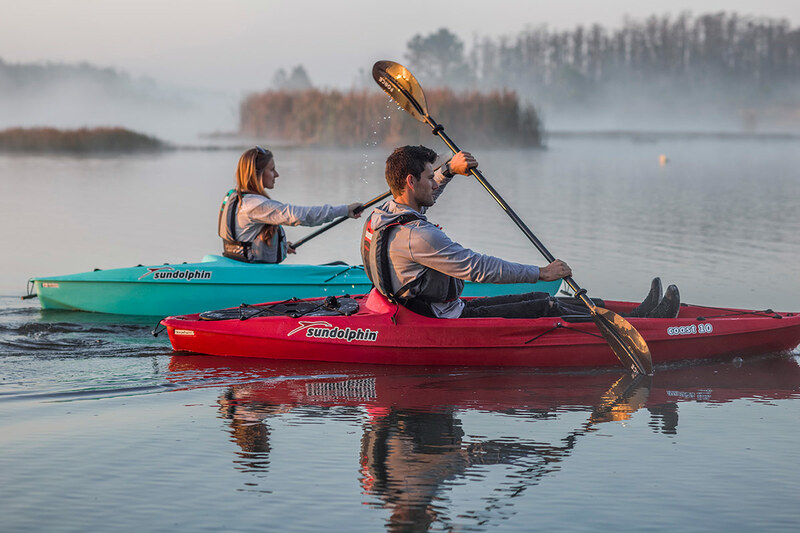 The best choice for brand-new kayakers, however, are “sit-on-top” kayaks, which are easy to get in and out of, and are usually made from forgiving, low-maintenance materials such as plastic or fiberglass. These kayaks are perfect for learning the ropes, and can take a beating—a great choice for beginners. When you’re buying a paddle for your kayak, you’ll want to purchase a double-bladed paddle. Unlike single-bladed paddles used by canoers, the double-blades are faster, easier to maneuver, and better in a headwind. The length of you paddle will depend largely on your size and strength, as well as your kayak. The taller you are, the longer paddle you’ll need. If your kayak is wide or tall, it will also benefit from a longer paddle. After all, you want to be able to comfortably reach the water! A good rule of them is to go to a sporting goods store and hold several different kayak paddles. You can also ask a sales associate to help you figure out your size—they are often very knowledgeable and can point you in the right direction. Safety first—especially when you’re a beginner. You’ll definitely want to buy a personal flotation device before you embark on your maiden voyage. Not only will it keep you from drowning should an accident occur, but in many places they are legally required. Choose something lightweight and comfortable that fits you well and feels good. After all, once you get the hang of kayaking you’ll probably end up spending hours on the water. The more comfortable your lifejacket is, the more likely you are to wear it. Before you know it, your kayak will quickly become your most prized possession. Because you want to enjoy it for years, it’s important to take excellent care of it. The best way to do that is by keeping it on a kayak rack when it’s not in use. We may be biased, but we think the Shore Tee by FootStake is the best option—especially for beginners! It’s affordable, which is important when you’re already dropping cash on a boat, paddle, and lifejacket. It’s portable, which means you can move it around until you find the perfect spot for your kayak. It will keep your boat clean and dry so it’s always ready to go. And it’s easy to use, which is a relief—after learning how to kayak, learning how to use a kayak rack is the last thing you want to do! Simply put the Shore Tee into the ground, step on it with your foot, and voila—you’re ready to rack! We hope these tips help you begin your kayaking adventure on the right foot. Enjoy, and we’ll see you on the water!